Would you recommend Spotify Discover Weekly to a friend? I feel like this solves one of the big problems with new forms of music discovery - their endless nature. If you have a discovery channel that just keeps on refreshing the more you scroll, the songs don't feel special. But with a weekly playlist like this, it feels more hand-crafted, and you're more inclined to give each track individual attention. @edrex_ agree with you Ed! Hey again product friends! We're loving your feedback on Discover Weekly so far. To make it easier for you, here are some answers to the most frequent questions. 1. What is Discover Weekly? It’s a weekly selection of new discoveries and deeper cuts based on your evolving music taste. Updated every Monday morning, Discover Weekly brings two hours of our best ever music recommendations, tailored specifically to YOU and delivered as a unique Spotify playlist. 2. When & How do I get it? 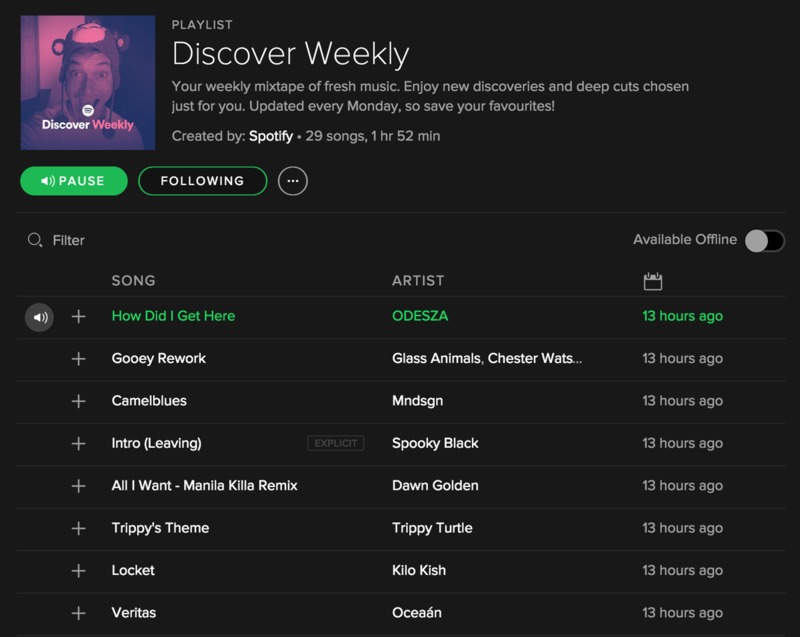 We started rolling it out today and you should be seeing a new playlist called "Discover Weekly" inside your Spotify app, personalized with your picture if you're connected to Facebook. If that is not the case yet, hold tight as we're still rolling it out, you should be getting it very soon. In case you are a new user, give us a little bit of time to get to know you and your music taste so we can deliver you with the best Discover Weekly possible. 3. What happens at the end of the week? Does the old list disappear? Get pushed down the playlist? Added as a different playlist? Discover Weekly is one playlist that gets refreshed with completely new music every Monday morning, which is why we suggest saving your favourites. Each playlist will include approximately 2 hours of music each week - meaning around 30 songs. It's also timezone synced, so you should get the update Monday morning no matter where you are in the world. 4. Can I share this playlist? And can anyone see it? Your Discover Weekly playlist is set to private by default, but you can open it up and make it available to anyone on Spotify. And just like any playlist, you can easily share it with the world across any device and platform. 5. Can I start following other people’s Discover Weekly? And how can I differentiate them in my playlist folder - won’t they all be called Discover Weekly? Yes, you can follow other people’s DW, as long as that person has set his/her playlist to public (hence a bit of early confusion in this thread!). Currently, the only way to differentiate DW playlists is the playlist image, but we’re looking into making this clearer in the future. 6. Can I delete the DW playlist? Yes, Discover Weekly can be unfollowed, like any other playlist created by Spotify. 7. Any pro tips? Yes, if you set Discover Weekly to offline, and leave your phone connected to wifi overnight, the new tracks will be ready to play wherever you are on Monday! I'm a big Spotify fan and I often find really good music in its Discover feed (buried under the Browse menu). Here's a screenshot of my personalized playlist this week (EDITED with a link to my playlist -- previous link was bad): I love the ritual of a weekly new playlist but so far I'm not digging the suggestions. There are a few gems like Oddisee and Chet Faker but Spotify's standard Discover recommendations are better for me. @rrhoover I think that's because that's not your personalized playlist, it's someone elses. I think Spotify is still rolling out these playlists for everyone, since it's not showing up in my own playlists just yet. @edwin_de_jongh @rrhoover Hey friends! Great to see you discovered our new feature already. In case you don't see it yet in your app, don't worry it should be coming soon to you as we're processing a gradual rollout. And just to make sure there is no confusion: Discover Weekly is YOUR personal playlist, it's a fresh new playlist for you individually every Monday morning. Of course you can listen to other people's discover weekly as well, especially if you share their music taste since it's tailored to your personal music taste. @flaneur - started exploring my playlist and loving it so far. Is there any way to upvote or downvote songs to help tailor future playlists (similar to how it's done for radio)? Also, how does listening to your Discover Weekly playlist affect future playlists? @liora_ We don't have explicit feedback at the moment, although this is just version 1. Good idea ;) We've built Discover Weekly so it grows along with you and your listening, so everything you play on Spotify will affect future editions, and we pay a bit more attention to stuff you've played recently. We also have a few tricks to ensure you don't get caught in a recommendations feedback loop too. Happy listening! @flaneur @liora_ Now that I've been playing with this for a week, so many questions about how you're tracking this: 1) How do you know if a playlist was successful? Is it the number of times played? Whether or not those songs are incorporated into another playlist? (if the latter, what if ALL the songs get put on another playlist? Do you filter that out?) 2) How do you determine which songs are eligible for the list? I had two songs on my playlist this week that exist on other playlists. Is this based exclusively off of what WASN'T listened to in the past week? What's fair game? 3) How do you judge whether or not someone likes a song? If I hear X seconds and then skip through, does that song get counted? 4) What can I do to my listening patterns throughout the week to optimize my playlist come Monday morning? The hottest playlist of the summer, made just for you. What do you use to find and/or share music? What is the best app/service to discover new music? Discover the best Spotify integrations on Product Hunt.